Once the Harem of the "Favourite" of Morocco's Sultan Moulay Yacoub, connected via underground tunnels to the Bahia Palace. Though now filled in, the majesty of its history is evident following a 3 year restoration project by hotel designer Christian Ferre with an update of the facilities and the addition of a spa offering a full range of massages, waxing, beauty treatments with a range of spa products based on organic argan oil. There has also been a consequent increase in hotel services and renewed focus on service and providing guests an authentic experience without sacrificing any of the comforts. 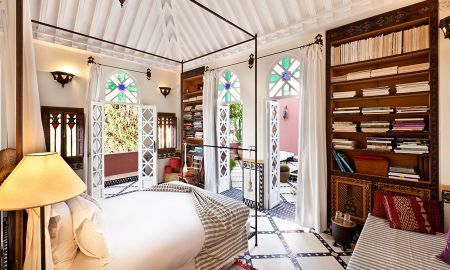 Riad Kaïss contains two courtyards with fountains and gardens, a large living room with an excellent selection of magazines and books and a grand fireplace, a dining room, full service spa, traditional Moroccan hammam, swimming pool, and several plant-filled sun-drenched roof terraces. 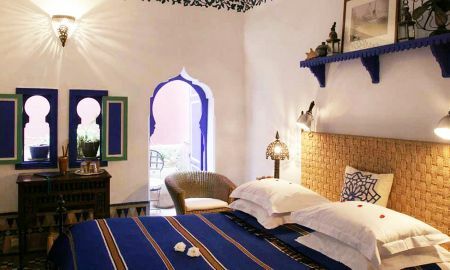 Riad Kaïss is one of Marrakech's longest established and most elegant riad hotels. The hotel is very centrally located in the heart of the old médina of Marrakech, just steps from the main square, the Djema El Fnaa. There are several major sites all within a 10 minute walk of the hotel: Badii Palace, Saadian Tombs, Bahia Palace, Dar Si Said Museum, Maison Tiskiwin Museum, historic Mellah neighborhood. There are also several restaurants to hand. Parking is available at either the Badii Palace or just near the riad at the Prefecture de la Police on Riad Zitoun Kebir (2 minute walk to our door).